His name is inseparable connected with the postwar Dutch film history. Photography was for him merely a stepping-stone to a career in making films. In the thirties he started as a photographer by the Vereenigde Fotobureaux, then he worked until 1939 under the name of his own photo agency ‘Express’. During the German occupation Haanstra played an important role in the resistance. 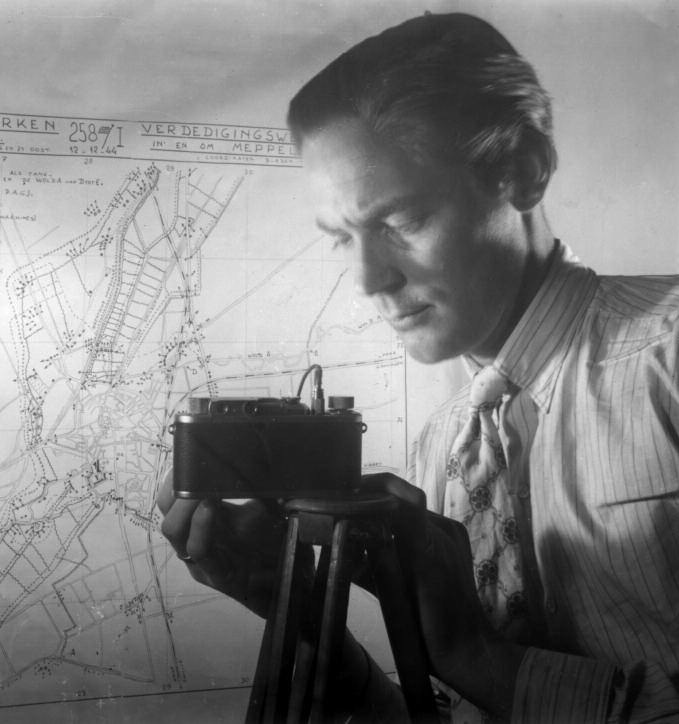 After the arrest of Carel Blazer in April 1943 he took over the photographic task during the resistance. The scene of action was the basement of the GEB-office at the Tesselschadestraat in Amsterdam, were the department photography and light were settled. In close collaboration with the GEB-official Jaap Carels, alias Brandt, Haanstra took hundreds of photos from documents and maps that were smuggled to England. At the same time he documented the construction of the illegal telephone connection ‘Brandt” that made it possible to have a safe connection between the resistance commanders of the Domestic Armed Forces. After the capitulation Haanstra was with his Leica camera witness on May 7 1945 of the shooting at the Dam. In contrast to the other 14 photographers he found himself in the centre of the German soldiers who started shooting from the Groote Club on the gathered Amsterdam citizen. Shortly after the shooting the Dam is desolated, only bodies. Photo from the collection Bert Haanstra Nederlands Fotomuseum. On the foreground stands a pick-up with in the platform the camera, an Askania 35mm, a German copy of the French Debrie Le Parvo, who had to take pictures of the liberation. It is not known who the filmmaker was, nor were the filmshots are. One and a half year later Haanstra purchased a same camera, second-hand for his first greater film. Close-cropped of a Dutch women who had a bond with the Germans, Amsterdam(1945). Probably made after May 7 1945. Source: Nederlands Fotomuseum.